Buy tickets now for our next concert: "Tonight, Eternity Alone"
To reserve tickets for Saturday 6 April (concert in De Pinte), email nonamechild@telenet.be. To reserve tickets for Sunday 7 April (concert in Brussels), click on 'more'. On 6 and 7 April the BCC will present a new programme entitled "Tonight Eternity Alone", featuring sacred and spiritual a cappella works from the 20th and 21st centuries. Click 'more' for more information. On 17 and 18 November, the singers of the BCC invite you to join them for a trip around the world, where you'll discover beautiful folksongs from Spain, Italy, Finland, Turkey, India, South Africa, USA, Venezuela, New Zealand and more. The concert on 18 November is a family concert organised as part of 'Kunstendag voor kinderen'. The BCC is looking for experienced choral singers to join the alto section. Rehearsals (and auditions) are on Tuesday evenings. Send us an email if you're interested. It was a pleasure to perform - for the first time in BCC history! - Bach's magnificent masterpiece. The concerts, in Kortrijk and Oudenaarde, both conducted by Wim Verdonck, were a big success. Click on 'more' to see a video recording of the opening chorus. Enjoy! Click on ‘more’ and scroll right down to read the full review in EN, FR and NL. The Brussels Chamber Choir will be singing Christmas carols at the Brussels Christmas market on Sunday 17 December, 14.00-14.30. It's part of the Wintervox series, which features professional and amateur choirs performing a mix of music on Place Sainte Catherine for free. So put on your woolly hats and gloves and join us! Exactly 10 years ago, some students from the Koninklijk Conservatorium Brussel decided to start up a choir, just for the pleasure of singing beautiful a cappella music together. 10 years along the line, the Brussels Chamber Choir has evolved into one of Belgium’s leading choirs, thanks to many rehearsals, concerts, workshops and performances, as well as to the passion and dedication of each and every one of its members. To celebrate our 10th anniversary, we will give a festive concert in the Notre-Dame du Sacré-Coeur church in Etterbeek. The repertoire has been chosen by the members of the choir and consists of a selection of favourite pieces from our repertoire over the last 10 years, including works by Rheinberger, Vaughan Williams, Rachmaninoff, Duruflé, Howells, Tavener, Gjeilo, Lauridsen, Mäntyjärvi, Pärt, Elberdin, Runestad and Charlton. And the choir’s composer-in-residence Jan Moeyaert has written a new work especially for the occasion. A concert not to be missed! Click on 'more' for practical details. After many months of preparing, rehearsing, fundraising, recording, editing, and producing, our first professional album is finally for sale! You can buy your copy of the CD through our website, or download it from iTunes or Amazon. Happy listening! The German-speaking radio station of Belgium featured our new album "Made in Belgium" during their program 'Klassik Zeit', last Wednesday - thanks to Stephan Laschet, the only germanophone composer featured on our CD. Click on 'more' to listen. Our 'Made in Belgium' CD will be ready to hit the shops on October 2nd! Come and listen to a selection of the recorded works in our ALBUM RELEASE CONCERT on Sunday 1 October at 15:00 in Etterbeek! With the recording sessions behind us, the CD booklet written, and the spirits high, we are ready to launch our album "Made in Belgium"! None of this would have been possible without the generous support from all of you, who helped finance this undertaking through our crowdfunding-campaign. A special word of thanks goes to our main sponsors: Alan Charlton & Nicola Robinson, Elien Cardon, Paul Gosme, Thierry Stulemeijer, Fam. Marien-Segers, Fam. Fobelets-Blaude, Pawel Nalewajko, Timothy Sullivan & Karen Ericksen, János Herman & Zsuzsanna Hermanné Mata, and J.H. The Brussels Chamber Choir is recording its first professional CD in 2017, featuring beautiful new music, all ‘Made in Belgium’. As you can imagine, this project is a huge financial investment for us, so we’ve started a crowd-funding campaign to help us cover the costs. If you’re interested in our project and would like to help us out, please click below to read more about the album, hear some of the works we recorded already in March, and pre-order your own copy of the CD! We hope to be able to count on your support! It was a real pleasure to sing for a large, attentive and very appreciative audience in the Horta Hall of BOZAR, as part of the Bach Heritage Festival, last week. We sang Bach Chorales in alternation with modern pieces. Two songs have found their way to YouTube. Click below to watch "O Sacrum Convivium" by former King's Singer Grayston Ives, a piece from 2001 which was not yet on YouTube. Last March we performed a wonderful concert in the church of Etterbeek. We brought beautiful a cappella music by Sibelius, Saint-Saëns, Vaughan Williams, Åsander, Elder and Whitacre. And we also performed many new works by Belgian composers, which will be featured on our CD album. Happy Birthday, Brussels Chamber Choir !! The Brussels Chamber Choir celebrates its 10th birthday in 2017! We have come a long way in these 10 years, and would like to thank you, our audience, for your support and encouragement! To mark this special year, we have decided to record our first professional CD. We gather in the beautiful chapel of the former convent in Huldenberg for two recording sessions (March & June), and a CD-release for the label ETCETERA is planned for the autumn. 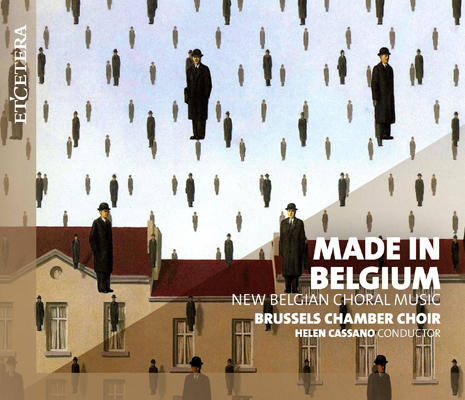 The programme for the CD will focus on beautiful NEW choral music, all of it “Made in Belgium”. The album aims to be a tribute to the country’s rich diversity, celebrating the traditions and influences of the music, people, languages, and cultures that have developed and converged, and continue to thrive in contemporary Belgium. We’re currently very busy with the preparations for this recording, and will soon announce a crowd-funding campaign to help us get there! We hope to be able to count on your support! It was a real honour and pleasure for the BCC to give a Christmas concert in the Brussels cathedral. Click below to hear one of the highlights of our attempt to fill the magnificent space with beautiful music. Enjoy! Paul Mealor composed this beautiful piece for the royal wedding of Prince William and Kate Middleton in April 2011. We programmed it as the closing piece of our anthology of English cathedral music. Click below to watch a video recording of last Sunday's performance in Tielen. Enjoy! Our Cloudburst concerts were very well received by both our live audiences and the weather gods. During our performance of Eric Whitacre's "Cloudburst", lightning came flashing through the stained glass windows - as you can see in the video by clicking below! The BCC came back from its first tour abroad with a strong desire to repeat such a wonderful experience. The Italian audiences, especially in the mountain villages, loved our singing, and we enjoyed singing for them. A lot of good memories were captured on video. Click below to see our Italy-playlist on youtube! After a final rehearsal in Etterbeek, the BCC is ready to conquer the hearts of Italian audiences! Check out our exciting concert schedule for our first tour abroad. And if you're in the neighborhood of Milan this week, don't miss our concerts! Our new project has been baptised "Heavenly Voices". Click below to find a teaser video for our upcoming concert on the 6th of June! After 7 years of existence, the BCC is preparing for its first concert tour abroad. The choir has been invited by the International Federation for Choral Music to give 7 concerts in Milan, during a choir festival organised in relation to the EXPO MILANO 2015. The choir is preparing a varied programme with a cappella masterpieces. Before taking it to Italy, the choir would like to "try it out" on its Brussels audience in a concert on 6 June. Check our agenda page for details! The BCC is looking for experienced choral singers of all voice types, especially altos and basses. Rehearsals (and auditions) are on Tuesday evenings. Send us an email if you're interested. The Brussels Chamber Choir will perform for the very first time in the most famous concert hall in Brussels: the Henry LeBoeuf hall in the BOZAR Centre for Fine Arts! Don't miss our FREE performance, as part of the Singing Brussels Celebration Weekend. On Saturday 13 September at 16:00. The Brussels Chamber Choir took part in the online choir competition organised by Cobra.be. We did not win it, but the jury mentioned us especially, for our serene and intimate performance of Eric Whitacre's "Lux Aurumque" Thanks to all who voted for us! Our Lux concerts were a tremendous succes, both in quality of choral singing and in audience attendance. If you missed them or if you want to relive the experience, you'll find the best moments in a youtube playlist following the link below. Happy listening! No less than 4 choir babies were born in December-January: Carlos, son of soprano Ma�t� / Antoine, son of alto Marie / Rune, son of alto Selina / Emma, daughter of our conductor Helen. The choir wishes all mothers and babies a wonderful time and a quick recovery. In the meantime, the choir enjoys the professional leadership of interim conductor Tom Deneckere. Eric Whitacre was in Brussels on 19 October to give the closing keynote lecture at a conference organised by the Family Firm Institute. The Brussels Chamber Choir was asked to participate as a choir for Whitacre to "use" as part of his lecture. The short rehearsal we had with Mr. Whitacre made its way to youtube. Our 'Summertime' concerts are over. For those who missed it, and for those who want to relive the emotions, most of the songs made it to youtube. Look for the Brussels Chamber Choir playlist! The Brussels Chamber Choir is preparing for their jazzy summer concerts, on 20 and 22 June in Brussels. Click on 'more' to see a promotional preview video, also including all practical information. The BCC has received sponsorship from the King Boudewijn/Baudouin Foundation for its project 'Enhancing the image and social connections of Brussels Chamber Choir in the 2011-12 season�. BCC wins THIRD prize in the IKV competition!!! The Brussels Chamber Choir is delighted to announce that during the 11th edition of the International Choir Competition of Flanders-Maasmechelen in September 2011, it was awarded the THIRD prize in the Mixed Choirs category, ex-aequo with the Russian Bryansk City Academic Choir. Sign up for our mailing list and stay informed of our future BCC events!